Wu, X., Clough, S. J., Huber, S. C. and Oh, M. (2013). IEF-2DE Analysis and Protein Identification. Bio-protocol 3(19): e924. DOI: 10.21769/BioProtoc.924. Radwan, O., Wu, X., Govindarajulu, M., Libault, M., Neece, D. J., Oh, M. H., Berg, R. H., Stacey, G., Taylor, C. G., Huber, S. C. and Clough, S. J. (2012). 14-3-3 proteins SGF14c and SGF14l play critical roles during soybean nodulation. Plant Physiol 160(4): 2125-2136. 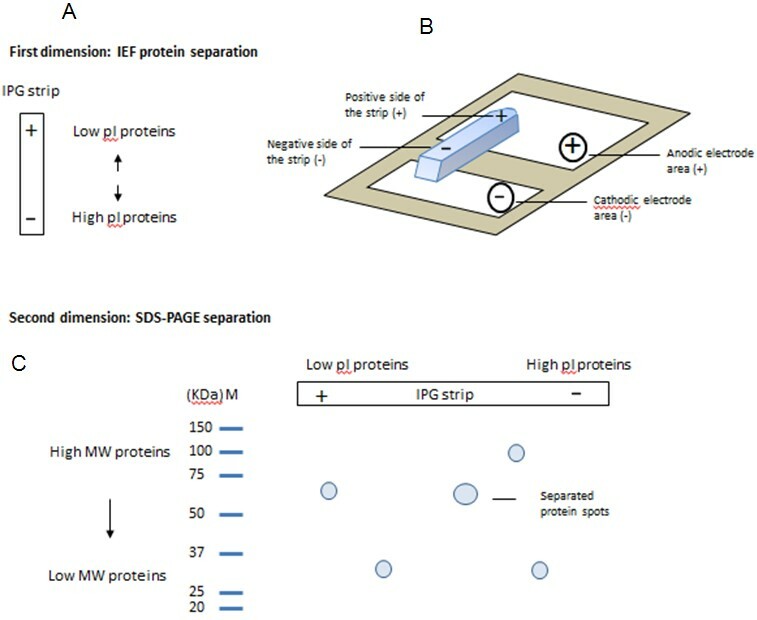 Isoelectric focusing followed by SDS-PAGE (IEF-2DE) separates proteins in a two-dimensional matrix of protein pI (Protein Isoelectric Point) and molecular weight (MW). 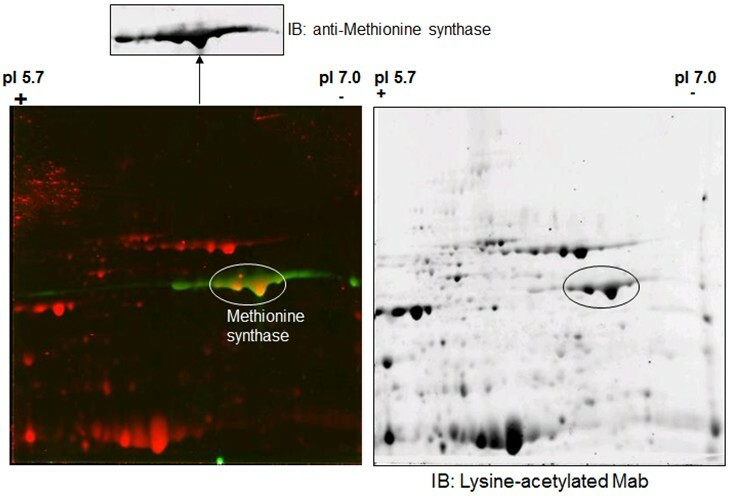 The technique is particularly useful to distinguish protein isoforms (Radwan et al., 2012) and proteins that contain post-translational modifications such as phosphorylation (Oh et al., 2012) and lysine acetylation (Wu et al., 2011). Proteins that are separated by IEF-2DE can be identified by immunoblot analysis using sequence-specific antibodies or by mass spectrometry. To maximize the separation of proteins by IEF, the protein extracts should contain minimal contaminants of salts and detergents. Here is the method we used to prepare protein extracts (protein extraction buffer: 100 mM Tris-HCl, pH 8.0) for IEF analysis. Mix crude protein extract and ice-cold phenol (TE-saturated, pH 7.9) in a 1:1 (v:v) ratio. Vortex for 1 min. Centrifuge the mixture at 24,000 x g for 15 min at 4 °C. Carefully remove upper aqueous phase and discard (do not disturb interphase). Add equal volume of ice-cold 50 mM Tris-HCl (pH 8.0) to the protein mixture. Vortex for 1 min. Centrifuge at 24,000 x g for 15 min at 4 °C. Remove upper aqueous phase and discard (do not disturb interphase). Repeat steps 4 to 6 once more. Transfer the lower phenol phase (including interphase) to a new ice-cold 15 ml tube and add 5 volumes of ice-cold 0.1 M ammonium acetate (in methanol). Vortex for 1 min. Precipitate proteins overnight at -20 °C. Gently and briefly vortex to resuspend the protein precipitate. Split the samples between 1.5 ml microfuge tubes as necessary. Centrifuge at 24,000 x g for 20 min at 4 °C and carefully remove the supernatant. Add 1 ml ice-cold 0.1 M ammonium acetate (in methanol) to each microfuge tube. Let pellet “soak” in the buffer for 10 min at -20 °C. Centrifuge at 24,000 x g for 20 min at 4 °C. Pipette out the supernatant and take care to not disturb the pellet. Repeat steps 12 to 15 twice. Wash each pellet further with 1 ml ice-cold 100% ethanol. Pipette out the supernatant (as much as possible). Resuspend each protein pellet with the volume of about 50-100 μl IEF sample buffer. The total resuspension volume per sample is about 500 μl. Vortex the pellet and let it dissolve in IEF sample buffer at room temperature for 1 h. Do not heat the pellet in IEF sample buffer. Centrifuge at 24,000 x g for 20 min at room temperature. The resulting supernatant is suitable for IEF analysis. Quantify the protein concentration with the Bradford assay. Store protein extract at -80 °C until use. Thaw the protein extract at room temperature. Centrifuge the protein extract at 24,000 x g for 20 min at room temperature to remove any precipitate. Take an aliquot containing 200 μg of total protein and adjust the volume to 250 μl with IEF sample buffer. Note: A good range of sample loading for a 13 cm IPG strip is about 100 – 250 μg total proteins. Generally, we used 13 cm IPG strip (pH 3-10), but we can choose the strip depend on proteins analyzing. Load 250 μl of each sample uniformly into the ceramic strip holder (13 cm size). Take out a 13 cm IPG strip and remove the thin plastic seal from the gel side of the strip. The pH range of the strip should match the pH range of the IPG buffer in the IEF sample buffer. Use a tweezer to handle IPG strip. Avoid touching the gel area of the strip. Carefully place the IPG strip onto the surface of the IEF sample in the ceramic strip holder, with gel-side down and the acidic end of the strip (marked with a “+”) towards the pointed (+) end of strip holder (Figure 1A). Figure 1. Illustration of IEF-2DE protein separation by protein pI and MW. A. In the first dimension, proteins are separated by protein pI in IEF strip. B. IEF setup to show the positive side the IEF gel should match the arrow direction of ceramic strip holder and the IPGphor positive electrode plate. C. In the second dimension, proteins are further separated by protein MW in SDS-PAGE. Carefully raise and lower the strip to assure the gel side of IPG strip is in good contact with the IEF sample solution. Overlay strip with about 1.5 ml Immobiline DryStrip Cover Fluid. Cover the strip holder with the plastic lid. Place the strip unit onto the IPGphor Manifold with pointed (+) end on the large “+” electrode plate. Begin IEF protocol #1 (Voltage-assisted rehydration sample loading) 20 °C, 50 μA per strip, 0 h rehydration (under non-voltage). Note: Ensure that the correct number of IPG strips to be run is entered. The IEF separation is completed. A good range to stop is at the 32,000 Vh to 42,000 Vh. Proceed directly to IPG strip equilibration (described below) or store the strip in a closed container before processing further at -80 °C. Pour a 1 mm x 20 cm sized 10% acrylamide gel (pH 8.8 or 9.2) using a flat comb with only a single protein marker well. Allow to polymerize for 45 to 60 min at room temperature. Rinse upper surface of running gel with de-ionized water. Prepare 2 L of 1x solution of Tank Buffer. Prepare fresh SDS equilibration buffer (± DTT or Iodoacetamide). 20 ml of buffer is needed for each IPG strip. Directly after IEF, remove the IPG strip and place it into equilibration tube with plastic backing against the tube wall. Note: Handle each strip individually. Don’t mix up the strips. Add 10 ml of SDS equilibration buffer (+ DTT) to each tube and gently shake on the rocker platform for 10 min at room temperature. Decant liquid from tube and add 10 ml SDS equilibration buffer (+ DTT) and gently shake on the rocker platform for an additional 15 min at room temperature. Decant liquid from tube and replace with 10 ml SDS equilibration buffer (+ Iodoacetamide) and gently shake on the rocker platform for 10 min at room temperature. Decant liquid from tube and add 10 ml SDS equilibration buffer (+ Iodoacetamide) and gently shake on the rocker platform for additional 15 min at room temperature. Use a tweezer to place IPG strip in-between the glass plates of the gel with gel-side up and acidic end strip (+) nearest the reference well. Use a 0.75 mm spacer to gently push the IPG strip onto the top surface of the second dimension gel. Avoid bubbles between strip and gel, and ensure good contact. Seal strip in place with about 500 μl of “cooled” Agarose overlay solution. Let solidify for about 3 min. Assemble gels into Bio-Rad Protean II. Fill upper buffer tank with 1x Tank buffer until full. Place remainder in bottom buffer tank with stir bar. Load 20 μl Bio-Rad protein standards into the reference well. Following IEF-2DE protein separation, proteins can be transferred onto PVDF membrane for immunoblot analysis. We used the Bio-Rad semi-dry transfer system and found efficient transfer. Wu, X., Oh, M. H., Schwarz, E. M., Larue, C. T., Sivaguru, M., Imai, B. S., Yau, P. M., Ort, D. R. and Huber, S. C. (2011). Lysine acetylation is a widespread protein modification for diverse proteins in Arabidopsis. Plant Physiol 155(4): 1769-1778.